The 8th International Seminar on “The Images of Memory: The Newest Technologies of Preservation and Restoration of Manuscript and Printed Heritage” took place on September 12-15, 2018, in the Matenadaran after Mesrop Mashtots and the National Gallery of Armenia. The participants of the seminar were restorers, museum experts and archivists, high tech specialists from CIS countries, Europe and Georgia. The seminar included master classes, roundtables dedicated to individual themes, presentations, cultural programs, and more. The seminar was attended by the representatives of a number of authoritative institutions: The State Research Institute for Restoration, All-Russian Art Research and Restoration Center named after Academician I.E. Grabar, the Russian State Library, Eurasian Assembly of Libraries, the Russian Museum, the State Hermitage, as well as the representatives of the national archives and libraries of the Commonwealth countries. The purpose of the meeting was to raise the creative thinking, the level of practical and theoretical knowledge, qualification, skills and knowledge of young employees, restorers of museums, archives and libraries, as well as the acquisition of global experience in the use of high technologies. The opening ceremony took place on September 12 in the fresco hall of the National Gallery of Armenia. Within the frameworks of the International Seminar the Matenadaran handed the restored archival documents of Komitas Vardapet to the Charents Museum of Literature and Arts. 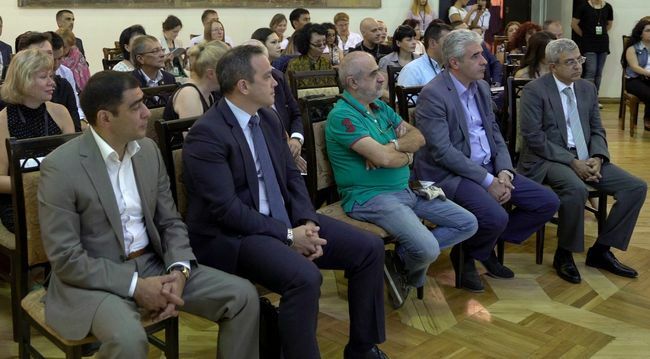 The international seminar was organized with the support of the RA Ministry of Culture and the Interstate Humanitarian Cooperation Fund, and in cooperation with the Ministry of Economic Development and Investments of RA State Tourism Committee.